According to our current model, our economy must continue growing exponentially year after year if it is to continue existing. 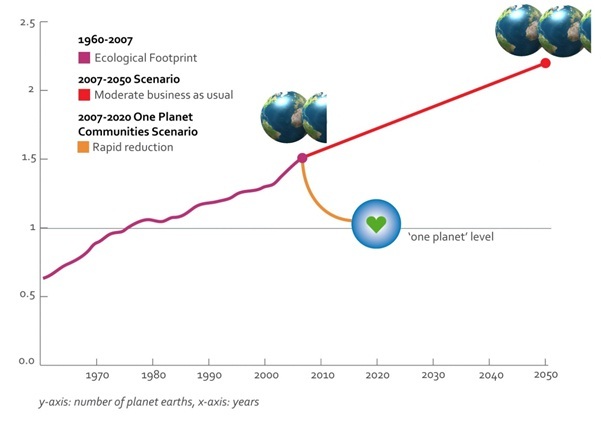 And yes, perpetual economic growth also implies perpetual growth in resource and energy usage; something which would have been OK if we lived in a magical world with no planetary boundaries, but which is very much not OK down here on planet Earth. Problems with an exponentially expanding economy on a finite planet are twofold: we are beginning to consume resources faster than the plant can replenish them and we are beginning to produce wastes faster than the planet can process them. The primary resources we are so unthinkingly consuming are water, food, fossil fuels and minerals. Water and food are renewable resources which we are now consuming at rates close to the upper limit that your planet can support. Fossil fuels are a non-renewable resource which only become available every 100 million years or so. And while most minerals can theoretically be recycled, this can only happen if the price increases so much that expensive recycling operations become economically viable. Food and water shortages are our most immediate concern. 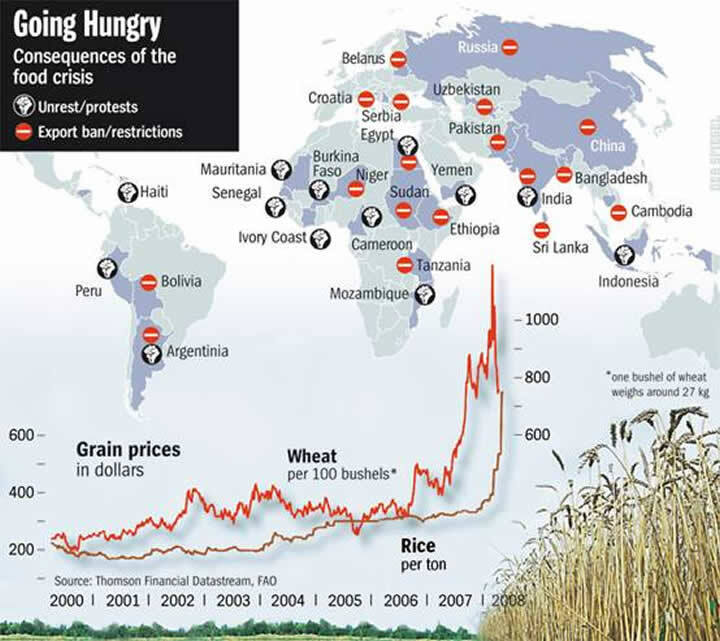 As shown below, a mismatch between demand and supply of basic foods like wheat and rice cause massive price spikes which spark massive social unrest as in 2008. Yes, if everything goes well, we can still feed the world, but we are pushing the boundaries so aggressively that it takes only one significant anomaly to seriously destabilize the system. Water is a little different. As a whole, we are still consuming much less than the planet can sustainably provide, but the problem is that water is not as easily traded between countries as food. As a result, the world already has a large number of countries with serious water scarcity even though many other countries have more water than they can ever use. Also, while access to water is one thing, access to clean drinkable water is something else. The graph below shows this to already be a major problem. 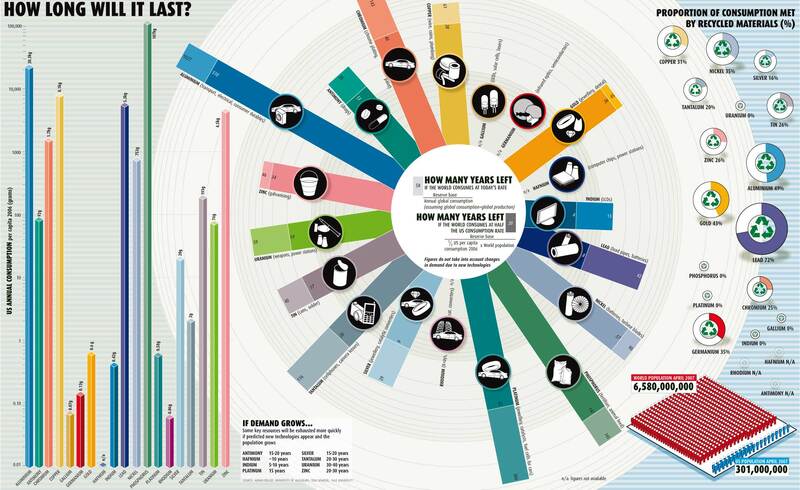 Fossil fuels have already been discussed on the previous page, but it helps to see this in a graphic form. When looking at oil, for example, the graph below clearly shows that discoveries of the cheap conventional oil that built our entire western civilization peaked many decades ago and that we have effectively been eating into our savings for a long time already. As conventional oil runs out, prices will rise quite sharply and our current economic model will break. The only way to moderate this rise is by curbing oil demand via high taxation (as is done in Europe and Japan). This tends to lead to economic stagnation and an increasing need to compensate through cheap coal, either directly or by outsourcing more labour to developing nations fuelled primarily by coal. Finally, many minerals that play irreplaceable roles in our economy today will run out within the next few decades. As shown below (click on the figure for a larger version), silver is one of the elements that will run out first. This is a major problem simply because silver is the second most useful commodity on earth, beaten only by oil. Do yourself a favor and read up on the many uses of silver to get some perspective. So, if the chart below is right, we may very well run out of the second most useful commodity on earth in 2-3 decades’ time. Within our current model of perpetual exponential economic growth, all of these things simply mean that everything will become more expensive. Energy prices lie at the foundation, but if you add independently rising food, water and mineral prices on top of that (and augment that with the ridiculous amounts of speculation we will discuss later on), the spikes can be truly outrageous. Such large shifts in prices will very quickly dump millions of people into poverty and cause massive social unrest which will only further destabilize our completely unsustainable economic system. When looking at the other side of the coin; waste excretion, the most serious concern is climate change caused by our greenhouse gas emissions, but there are also a myriad of other forms of pollution which are starting to cause serious global problems. The massive ocean dead zones caused by excessive fertilizer use is just one such example. But here we will just briefly look at climate change. Even though the climate change debate is still raging on, I have found that I become increasingly uneasy as I learn more about climate change. In a nutshell, the Earth contains several positive feedback mechanisms that will cause automatic self-sustaining global warming once we cross a threshold lying somewhere between 2 and 3 degrees of man-made warming. Now the scary thing is that the last time the Earth reached 6 degrees of warming (about 250 million years ago), more than 90% of all life was wiped out in a period ominously known as The Great Dying. Also, following the Great Dying, the earth took about 10 million years to recover from this massive shock. When you consider that such a mass extinction event could become completely unstoppable if we cross 2 degrees of warming, you will probably understand all the hype about global warming, especially since we are already approaching 1 degree of warming and not really trying very hard to slow down. 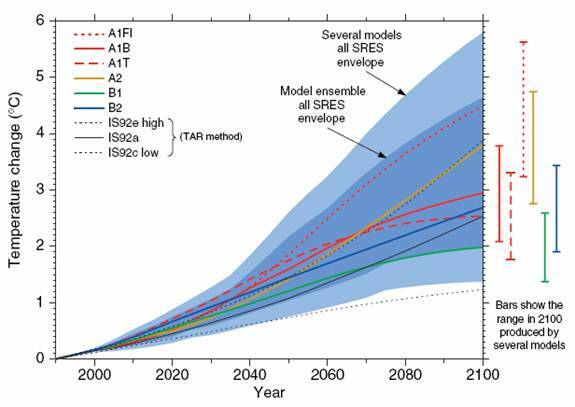 If mainstream climate science is correct and we keep to current policies, another Great Dying will probably begin within the 22nd century and life will already become very uncomfortable in the 21st. In practice, climate change and other forms of pollution simply reduce the ability of nature to supply us with the myriad of resources we so unthinkingly consume every day (ultimately culminating in a total collapse of ecological systems such as in the Great Dying). But yet, despite all of these factors that are threatening our supply of planetary resources, almost every politician on earth still sees more growth “stimulated” by more debt as the one and only answer to our current economic woes. The truth is, however, that this debt-fuelled growth is the cause of all our problems. Not only is this growth pushing us to the very limit of our planetary resource base, but the fact that almost all of it is fueled by debt has set us up for a potentially very large crash now that it is becoming increasingly clear that the world will never ever be able to repay its humungous debt. We’ll take this further on the next page. Let’s face it Schalk, the sudden reduction to 1.0 planet per annum in the space of ten years ain’t going to happen (unless the Earth really is hit by a giant asteroid – for which there is no evidence) and, in the interim, the longer we wait to make a start, the greater the annual decrease in fossil fuel energy use required in order to avoid blowing our global carbon budget. Hehe… Perhaps we will get hit by an economic asteroid before that. Who knows? But what would be the practical differences between the fee and dividend system in your link and a redistributive taxation system where taxes on green products are cut and transferred to environmentally damaging and unhealthy products? I briefly propose such a redistributive tax system as one of the solutions in this page series. As I see it the redistributive tax system will have the added benefit of actively incentivising consumers to buy green products, but the fee and dividend system will perhaps be better received by the public since it is essentially a tax reduction and not just a tax redistribution. This is a rather interesting topic and I am still trying to make up my mind about whether a redistributive carbon taxation (taxing carbon intensive products and giving equivalent tax breaks on sustainable products) or Hansen’s F&D scheme would be best. I was also wanting to run another idea by you about carbon taxes. As I understand it, the biggest resistance to these taxes is simply caused by the deniers who say that AGW is not real and it is therefore completely unnecessary to pay a carbon tax. So how about introducing a carbon tax system where people can choose to opt out of the normal carbon tax, but at a significant risk: those who opt out will be held financially responsible for the full negative impacts of, say, any extreme weather event outside of 3 standard deviations from the mean. For example, these people would have to subsidize tax breaks to compensate for the rising food prices that will be caused by the current drought in the US. Thus, if AGW is just a hoax, they will save a lot of money and feel very good about themselves, but if it is real, they will be held responsible as they should. You appear to describe the situation in Australia. However, in Austrailia, it is not just the deniers that are confused. In time, the Australian Carbon Tax is, as I understand it, going to morph into a cap and trade (C&T) scheme… As Hansen points out, C&T (the basis of the entire UNFCCC system) has failed to achieve anything (emissions are 40% up on 1990) because it sets limits on how much pollution can be emitted – it does not pay anyone to reduce their pollution. Producing waste must not be penalty-free.